After The Rain | Yobot Inc.
Wow, it’s been a long time since we posted. We’ve had a ton of excitement around Casa de New House. Thursday we witnessed horrible storms as they raged through the Chicagoland Area. It was really eerie. I was at work downtown when the blue sky turned black and the buildings disappeared from the skyline due to the torrent of rain, all within 45 seconds. I wasn’t really worried until I saw garbage swirling in a slow circle about 10 stories up – like a mini-tornado. You can see the pictures of the storm damage from around the area here. I guess we’ve gotten over 9″ of rain this month of August, and I’m hoping that’s the reason for our current house troubles. Robert called me about 8:00 PM – I was stuck downtown because of the storms. “I hate the ______(name of the people we bought the house from)” he said to me. Sadly, our basement was full of water. Well, not full, but about 1″ to 2″ of water in the laundry room, and all the carpet around the perimeter of the Rompus Room was soaked. I keep reminding myself that it could have been worse – much worse. We could have lost our house in a vicious tornado, or had the 60′ silver maple outside of our house fall on our roof and into our serene bedroom. So there’s a little water in the basement, so what? 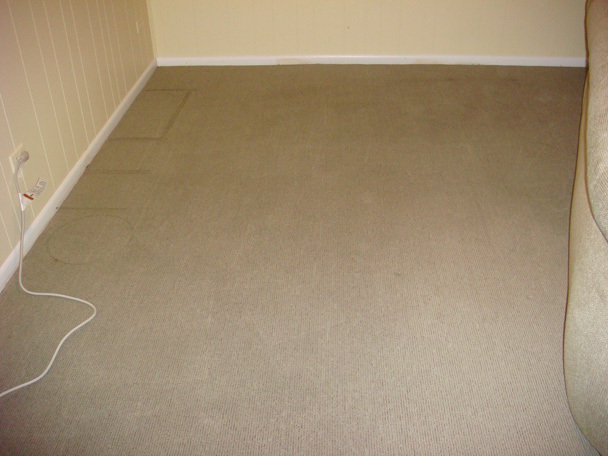 We began the cleanup by buying a de-humidifier and a shop vac, and removing about 10 gallons of water from the carpet. But our little efforts were useless, as we discovered last night. We had to rip up the carpet because when you walked into our house, it was like being hit in the face with a wall of mold. Here’s our carpet after the flood. I guess the mold is invisible to the camera. But believe me, it’s there. 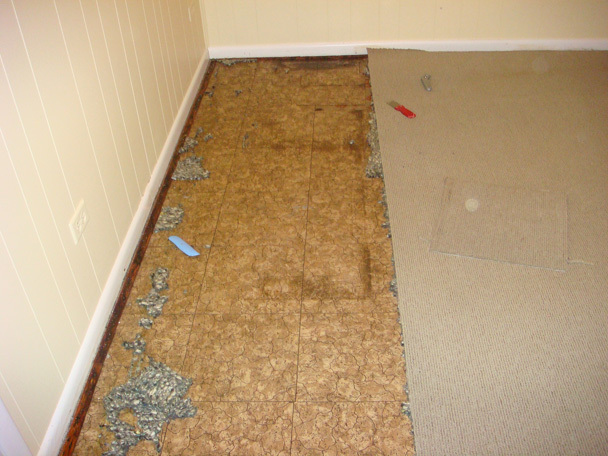 The carpet was soaking wet, and the carpet pad was even worse. We dragged it out into the garage. The tile underneath is a disgusting, dirty, old floor, which is easy to remove because the glue is soaking wet and no longer adhesive. We removed carpet for a couple of hours last night. The next big challenge is getting the behemoth of the couch out of the way so we can remove the dry carpet underneath – the only part of the room that wasn’t ruined. I’m buying a huge tub of bleach – I’m gonna wash that mold right out of our basement – sing along now. As Robert reminded me, I hated that basement carpet anyway because the pattern was too close to our couch pattern, and the colors weren’t great. At least we can get a new floor now. Yay New Floor!